The last few months have been like a rebirth, confirming my love of rail travel - intercity overnight sleeper from Paris to Berlin - and TGV to Dijon - Marrakech Express to Casablanca, Morocco - and Egyptian Rail sleeper from Luxor on the Nile to Cairo. I am also pleased during our months in Morocco to see how integrated rail and air travel is becoming - and the start of an intercity line at Rabat,. My endless fascination with railways and railroad memorabilia goes back to childhood days, when the White Pass & Yukon Railway of Gold Rush fame was linked via Skagway, Alaska, to a vast, complex transportation system of BC-Alaska Coastal steamships, caterpillar trains and Yukon river steamboats. Each trip we made 'outside' from Dawson City on the Klondike to Vancouver, British Columbia, involved four days upstream on the Yukon River by paddle wheeler; a day trip by rail from Whitehorse to Skagway; then another four lazy days steaming southward on CPR's Princess Norah or Louise. We sailed the Inside Passage, along the Alaska Panhandle and British Columbia Coast,stopping at the ports of Juneau, Ketchikan, Prince Rupert and Alert Bay. It's basically the same scenic route used by today's super liners and love boats. As a long time railway fan and originator of "Railways of the World," it's heartwarming to see the WP&YR not only still operating at Skagway, but considering extending the line to Whitehorse in future. The 177-km White Pass & Yukon Railroad was completed in 1900 between the Alaska coastal community of Skagway and Whitehorse, Yukon Territory The WP&YR served first as a passenger train and supply line for the gold fields of the Yukon and acted as a freight carrier for nearby lead and zinc ore mines. When the mine closed in 1982, so did the railroad. The railroad reopened in 1988 for passenger service but has only traveled the first 64 km of the line to Lake Bennett, BC. On May 28, 1998, the WP&YR celebrated the 100th Anniversary of the driving of the first spike on the railway, with a dedication and ceremony in downtown Skagway. Len Brown, one of our readers attended a "Last Spike" ceremony on July 29, 2000. Here is an excerpt: " Al York and I do contract work for the Yukon Government, and I was up there working and took in the celebration. It was fantastic - up to an estimated 5000 people were there during the day - steam rides some 5 miles alongside Lake Bennett and back .. and a Steam Meet of 73 and 40. I am a steam nut. As a Yukoner by birth, I hope someday there will be an extension of this historic rail line at least as far as Carcross, Yukon. Originally called Caribou crossing because of its popularity as a native hunting ground, Carcross was a stopping place for gold stampeders on their way to the Klondike gold fields. Trains haven't traveled to Carcross since 1982. 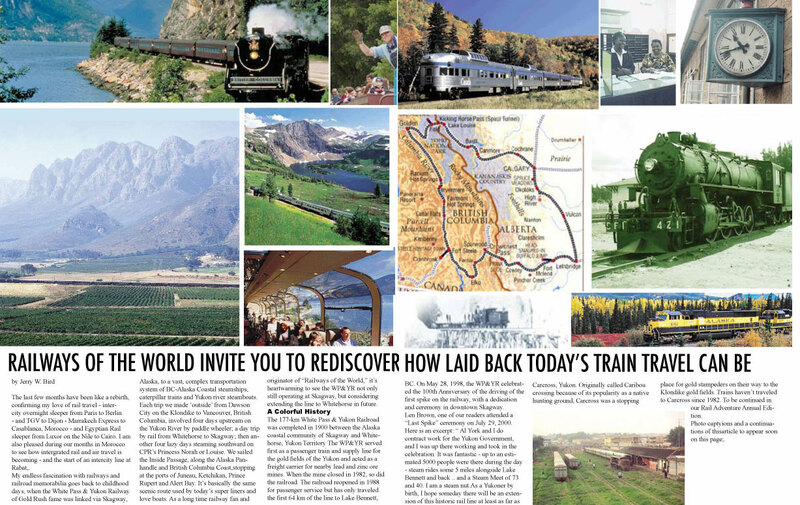 To be continued in our Rail Adventure Annual Edition. Photo captions and a continuations of this article to appear soon on this page;.